Just Show Your Card. Save Your Money. This chart gives you an idea of how much money you might save on average. Specific prices vary from one dentist to another, so we can’t tell you exactly how much your procedure will cost or how much you’ll save on a dental plan without insurance. *Per visit, in most instances on services at any of the many available dental practice locations. Actual costs and savings may vary by provider, service and geographical location. We use the average of negotiated fees from participating providers to determine the average costs, as shown on the chart. Based on the cost of care tool as of September 2017. Use your Carefree Dental card at over 20,000 vision care providers nationwide. Show your card at the time of service to assure the proper discount is applied. This is one of many dental card benefits. 10% to 60% off eyeglasses, contact lenses and other retail eyewear items as well as 10% to 30% off eye examinations and 40% to 50% off the national average on LASIK. Save on thousands of brand name and generic prescription drugs. Special Offer! When you activate your Carefree Dental Card right now, you’ll also receive a bonus of $2,000.00 in Accident Dental Expense Benefit at NO ADDITIONAL COST – courtesy of Carefree Dental. 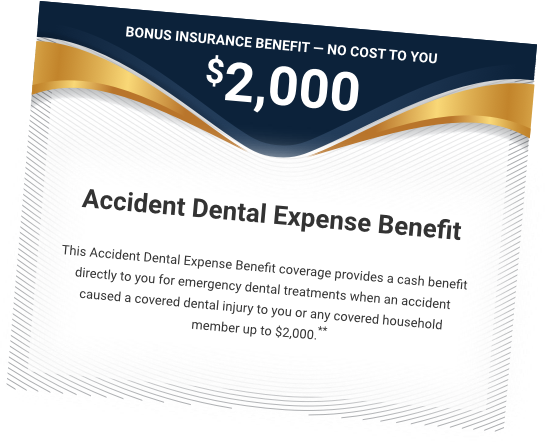 This benefit provides a cash benefit for emergency dental treatments when an accident causes a covered dental injury to you or covered dependent in your household. **The Accident Dental Expense Benefit, Group Accident Only insurance is issued on Form Series MP-1400/GC1400 by Guarantee Trust Life Insurance Company, Glenview, IL. This product and its features are subject to state availability and may vary by state. Certain exclusions and limitations may apply. Offer available only with paid membership.